While you can find lime shrimp in the freezer section of most markets, you'll find that it's very easy to make yourself at home. 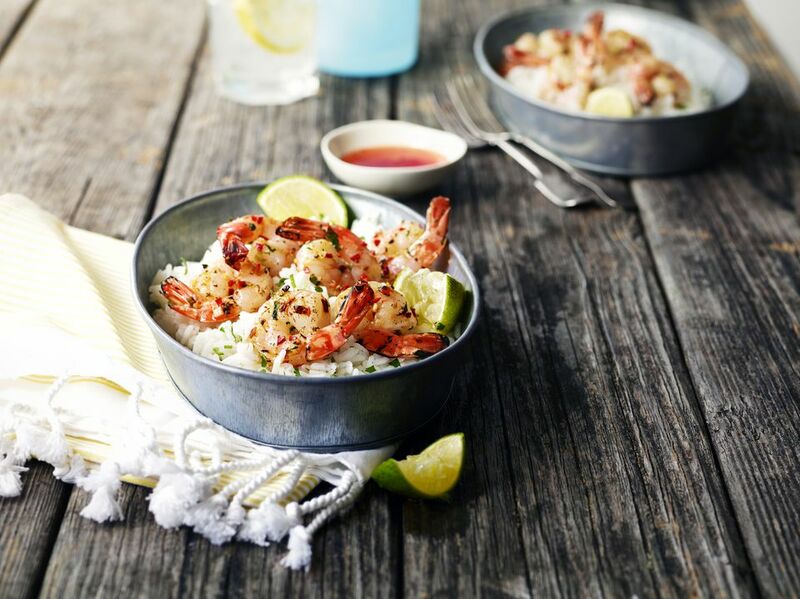 This Caribbean island lime shrimp recipe (or margarita shrimp, if you prefer) is a zesty and simple dish that will outshine anything you can buy. The recipe simply requires a marinade and a flash in the pan. The glaze is a flavorful mix of tequila, citrus juices, and a number of common herbs and spices. It's perfect when served with white rice and makes a great party dish that can be enjoyed at room temperature. In a large zip-top plastic bag, combine all of the ingredients except the tablespoon of olive oil and shrimp. Seal and squish the contents to mix it thoroughly. Add shrimp to the margarita marinade, squeeze out all the air, and seal. Turn bag to coat the shrimp. Refrigerate for 30 to 45 minutes. Do not over-marinate or the citrus acids will "cook" the shrimp. Heat a large, heavy skillet over medium-high heat. Add 1 tablespoon olive oil to hot pan and swirl to coat. Remove shrimp from marinade and place in a single layer in the hot pan. Reserve the marinade. Cook for one minute, then flip the shrimp to the other side. You may need to do this in batches, depending on the size of your pan. Do not overcook the shrimp or it will become rubbery. Remove shrimp and keep warm. Add the reserved marinade to the hot pan. Continue cooking until it reduces to a thin sauce. Turn off heat, return the shrimp to the pan, and toss them in the sauce to coat. Serve the shrimp over white rice. If you cannot consume alcohol, simply leave the liquor out. You'll still be able to enjoy the spiced tropical flavors of the dish. If you do not normally stock tequila or triple sec at home, simply pick up miniature single-serving bottles. This recipe will use about half of a miniature bottle for each liquor. There's also no need to buy an expensive brand, so feel free to save some money unless, of course, you feel like mixing up a margarita or two.